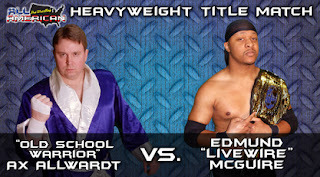 The main event of AAPW Main Event features a clash between the champion Edmund "Livewire" McGuire and "the Old School Warrior" Ax Allwardt. To call this a grudge match is a huge understatement. Ed and Ax do not like one another. Early in the season of Collision, Ax attacked Ed backstage. The vicious assault hurt the champ physically, but mentally I think it woke him up. The two battled it out midseason with Ed getting the win. But Ax wasn't satisfied with that and earned the right to a rematch with a win over former champ, the Mississippi Madman. The attacks and fighting continued, so AAPW Executive Producer Chris Hagstrom told the two they couldn't touch each other prior to Main Event or Ed would be stripped of his title or Ax would lose his title match if he was the aggressor. Ax took it upon himself to pile drive Ed's best friend KC Jackson three times on a recent Collision. Despite wanting to rip off Ax's head, the champ kept his cool. But devious manager Gaylord Stevens suffered the wrath of the angry champion. Now it will finally come to a head. No disqualification. Can Ed get revenge from the attacks and mind games Ax and Gaylord have been playing? Or has Ax found a way to permanently unplug the Livewire? Join us Saturday, January 14 to find out.